Last September Honey and Lone Wolf Cycling held a weekend of adventure riding hosted by the Ride Studio Cafe in Lexington, MA. It was a great weekend of offtrail and on pavement adventure riding. Putting on back to back rides of this type was an ambitious undertaking but was well worth it! So many smiles per mile! As part of the weekend Lone Wolf and Honey created a trail fund called the Trail Wizard. It was inspired by all the rides we had all done to put the two routes together for the weekend. While riding with the Lone Wolf crew in Weston we started laughing and singing "Trail Wizard". At first it wasn't clear whether we were the Trail Wizards or if we were looking for the Trail Wizard. Regardless, the name stuck and it gave birth to the idea to create a fund that would support local trail work. Adventure riding or mtn biking on CX and Allroad-style bikes wouldn't be possible without the work of all the great advocacy groups who lobby to keep access open and who build and maintain the actual trails. We decided to do a raffle at the after party of the Lone Wolf ride on Sunday, September 14th. Honey donated an Allroads frameset to be raffled off. To say people were excited to win the bike was an understatement. Proceeds from the raffle were used to help Belmont in Philadelphia. It was a great partnership between two regions, Philly and Boston, who embrace the same sense of adventure and love of riding in the woods! The winner of the raffle was Jonathan Sainsbury, a local rider from Cambridge, MA! He is a designer and asked if he could come up with a concept for an original paint scheme for the bike. He integrated some of the LWC Trail Wizard graphics we had used on the event. One of the fun things about the Allroads bike is that it can be so many things to so many riders. It is always exciting to see how each rider specs their bike to suit their vision of what Allroads means. Jonathan's paint scheme has so many fantastic little details going on it that tell a personal narrative about the bike and what it is all about. It is a testament to the painters at Honey that they can always take a rider's vision and turn it into a beautiful work of rideable art. A lot of people work on each Honey. Each bike is built to order, one at a time and by hand. The signatures on Jonathan's Allroads reflect just how much passion went into his bike. There are a lot of adventures ahead for this bike. We hope Jonathan loves his new Honey! Look for the bike at the Honey Winter Party on March 7th and hopefully Jonathan can join us on the Diverged ride on April 25th! We have been riding the Offtrail pretty much non-stop since we launched the bike at this year's Providence Cross Festival Builder's Ball. What we have found in that time is that the bike is pretty much our favorite trail bike. Winter has been slow to descend upon us here in New England this year. We have had a few snow storms and some bitter cold but not the 70 inches of snow we had last Winter. This has been a great opportunity to test the Offtrail in a very varied and ever changing off road test track! We put 4" Surly Nate tires on the bike initially to give it a great balance between trail handling and stability/shock absorption. The Nates are a fantastic tire for trail riding. Pretty much the perfect woods tire in my opinion. Great traction on mud and rocks but also fast and nimble in singletrack. But the biggest challenge in the winter for riding a bike isn't snow it is ice. Snow can slow you down and make the going tough. Ice can break your hip. Sounds dramatic but its true. One crash on ice and you will be a believer in studded tires. I got a reminder a few weeks ago at just how hard a crash you can have on a patch of ice. While riding Blue Hills with some friends I came bombing down a trail. They were up ahead yelling what I thought was "RIGHT" aka turn right. They were in fact yelling "ICE" I of course wanted to impress my friends with my rad skills so didn't touch the brakes and just went faster. I crashed so fast and hard I had to lie on the ground for a moment doing an internal check to make sure I wasn't broken. Thankfully I crashed so fast I didn't even let go of the bars. Likely saving my wrist/collarbone. The multiple layers and "winter weight" probably saved my hip. I was bruised and sore for days but otherwise unscathed. But I got my winter wake up call and put the studded tires on. To say I am impressed by the 45NRTH Dillingers is an understatement. They weigh in about the same as the Surly Nates that don't have studs. They are a "faster" rolling tire if you will as well. I have taken them out on a frozen pond (which was a bit nerve wracking) and over sheer ice under snow. They hook up so well. The tires even work well on some of the trails that aren't covered in snow. I am a huge fan of NEMBA. Every since I moved back to New England I have been so impressed by the work they do on trails and working to build the community. There are some really great people working hard to make sure the trails stay open and to help grow mountain biking. It doesn't hurt that they are all really cool people. My good friend Lee Toma lives over near Blue Hills and always posts such great photos of the riding. I have only ridden a few times on Blue Hill. It really is a gem of a riding area near Boston. When Lee told me NEMBA was going to be doing a Toys for Tots ride I immediately said sign me up! The ride was schedule for the Sunday after the traditional season finals of our CX season. I asked via the internet for people to please bring a toy to Ice Weasels that we could donate to the NEMBA Toy drive. The #NECX came up big time. I was expecting a few toys but what showed up was very unexpected. We collected three bins of great toys! What a difference that is going to make in some kids lives. I am sad to admit I haven't done too many NEMBA rides. Maybe one or two. So I didn't really know what to expect. People were so friendly. I didn't know anyone other than Lee and Steve Cobble but everyone welcomed me on their ride like I had been a part of their club ride for years. It was nice to see so many fat bikes! Lee and I both were on our fatties. I have to say I am loving riding a fat bike in the woods even without snow. The woods in New England are strewn with fallen leaves. The leaves hide all manner of dangers-rocks, roots etc. Throw in some rain and you get a real tricky riding surface. A fat bike with its big tires at low pressure just grips and rolls over all of it. Not to say you can't drift a bit here and there but it makes the riding so much more safe. And fun! Lee and I joined Steve on the "easy" ride. It was a big group. Nicely mixed by different levels of abilities and it was very nice to see an almost 50/50 split between men and women. Steve led the ride from Houghton's Pond. We rolled mostly over wide fire roads but did jump into some really fun "secret" singletrack. We rode out to a former Nike site which was totally surreal. The woods were in good shape. I would say we rode for about 2 hours before heading back towards the lodge. We stopped to take a great group photo and enjoy the beautiful day. I can't say how impressed I am by how the group rode together. NEMBA really works on keeping the riders together so no one gets lost or separated from the group. At intersections one rider would stop and wait til the last rider came through and made the turn. We accordioned on this way for the whole ride. At the two hour point most of the group wanted to head back and get some food. A smaller group of us decided to head up to Buck Hill. I had heard of Buck Hill but never had the chance to ride it. Buck Hill is a new trail built by NEMBA. Riding a trail built by mtn bikers is so nice. It has such a nice flow. It is a switchback climb with some technical features that really make you concentrate on the climb. When you pop above the tree line the whole sky seems to open up. From the top you can look in 360 degrees and get an amazing panoramic view of Boston. We spent a fair amount of time on top of Buck Hill talking about the ride and all the hijinks that had ensued. The descent off Buck Hill was a blast. We rolled back as a group to the lodge with ear to ear grins. I can't believe how much great riding that there is in this area. NEMBA has done an amazing job working with the DCR and the local community. What a great day of riding and meeting new friends. Thank you to NEMBA, DCR, Lee Toma, Steve Cobble and the #NECX for helping make the NEMBA Toys ride so successful. I have been dreaming of riding the Offtrail in snow since October. It is a great trail bike and makes riding in the woods on mountain bike trails so much fun. But the fat tires just were begging to play in powder. Looking at the forecast for the Thanksgiving break my stoke level went off the chart. A Nor'easter was bearing down on the coast of Maine where we would be spending our holiday. I have spent the last four years scouting out the trail system around the farm we stay at. They are a great mix of paths and singletrack in beautiful wooded terrain. There are also a couple of sections that include a beach! I have ridden Kettle Cove on my CX bike a bunch of times and it is always a blast. But the thought of riding it on the Offtrail opened up parts of the beach that were too soft to ride on skinny tires. I got a bit of a late start which made for some snow that was a bit softer than optimal. And most of the trail was fresh pack. I saw a few deer tracks but that was it. I had the whole winter playground to myself. Things that would usually put fear in my heart, like a snow covered boardwalk were no problem at all. The big fat tires at 8 psi just floated over everything and were incredibly stable. The biggest problem I came across were all the trees that had fallen down in the high winds and heavy snow. A fair amount of limbo and crawling under and over tree limbs added another level of adventure to an already super fun ride. The first half of the ride went without a hitch. I knew most of these trails and the section by Kettle Cove. Once I popped out onto route 77 things got a bit how you say "interesting". I was hunting for an open space I had ridden last summer. It was new to me and really well marked. As I rode along the nearly abandoned road I saw a sign at the edge of the woods I had never seen before. It looked very promising. It was called Cross Hill and was part of the Cape Elizabeth Conservation Area. It had a very detailed map of the trails. I took a photo on my iPhone so I would have it in case I needed it. The trail reminded me of the Cross Town Trail in Wellesley. It wove in and out of neighborhoods. It never was too far from a road or a house. At some point I began following a power line trail and that is when things got a bit "exciting". I began regretting not telling my wife where I was riding. And of course sunset was creeping in. And of course the snow was getting deeper and softer. And my phone was dying. Did I mention I hadn't brought a light or any type of safety gear for winter woods riding? Yeah, I basically was a massive fail for being prepared in the woods in winter. Little alarm bells were going off in my head but I was ignoring them and putting them into little boxes. The good news was that the trail was incredibly well marked. I couldn't even see the trail as it was so covered in snow but the trees had blazes and arrows. So I kept pushing on and having an amazing time. Riding in this type of snow on the Offtrail was more like surfing than riding. I would literally laugh as I dropped down little chutes on the bike. I stopped laughing once the trail markers stopped. Ok, I thought. Now you have my attention. I was deep in the trees so couldn't tell how dark it was. It was definitely dusk and getting darker by the minute. I remembered a fence about a half mile back so I backtracked as quickly as I could. I saw a house and relaxed a touch. I almost just went up through the backyard but didn't want to trespass. So I just followed the border of the fence until I saw a berm which clearly led to a road. I trudged up the berm and dropped down the other side to pavement. I was never so happy to see a paved road in my life. I rode back on 77 all the way to the house thinking just how lucky (and stupid) I was. I pulled in right as darkness fell over the coast and walked into the smell of Thanksgiving. That turkey and IPA never tasted so good. This past Veteran's Day a bunch of us headed down to Falmouth, MA for a race at the Coonamessett Farm. It is a great local grassroots race put on by Corner Cycle. Its always been one of our favorites. We packed up a bunch of friends and bikes into the van and headed south from Boston. One of the biggest draws, other than the cool farm and great vibe, was the Fat Bike race. Eco-Cross has been doing a cyclocross race for a while now. Its always fun and has some really cool mountain bike sections. Corner Cycle is really into Fat Bikes so it was only natural that they would add a Fat Bike Category to their race. I am pretty sure this is the first time Fat Bikes have been raced as a category in a cross race in New England. Corner Cycle did it right. They had a stable of about 20 Fat Bikes for people to borrow so they could try it. Fat Bikes are fun. We all know that. But what would racing them be like on a cross course? We were about to find out. Thirty people lined up for the Fat Bike race at the end of the day! It was incredible to see so many fat bikes lined up for a race. Even the USAC official didn't know what to think of this. His last words before blowing the whistle were "please everyone be careful and no one get hurt!" I assumed it would be a Fat Bike parade. But no, like all things in New England, it was race time! The start was just as furious as the Masters race we had done 2 hours before. And the chopping and dropping just as spirited. There was a big crash on the first fireroad and somehow me and the big man in an orange jumpsuit got around it! Gewilli escaped with two Corner Cycle riders and I spent the whole next three laps trying to chase them down. It took all my effort to do so! But it was so much fun you didn't even notice who hard you were pedaling. A Fat Bike smooths out so much of the rough stuff that would usually bounce you around on a cross bike. We were flying through the woods. And every time I would come up over the second hill and see the goats it would just give me more energy! To say I was beyond impressed by how fast the Honey offtrail was is an understatement. The bike felt as fast and nimble as my mountain bike. That really was the whole idea behind the design of the offtrail. After three laps I came around to see the leaders having a BBQ and beer stop at the barriers. Just as I rounded the corner to join their party they were gone! I did my best to chase them but they were too fast! As we came into the finish there was a lot of yelling and pointing. I could make out "One More Time!" And "Jump It!" Not to disappoint I headed out on what I thought was one more lap. What it in fact was, was a Ramp of Doom. My good friend Gewilli had rammed through one of the barriers on the last lap. Some spectators had taken the fallen barrier and put it across the first barrier to make a ramp for us to jump over the barrier. Not to disappoint I headed down to (what I thought was certain death) the ramp and let it roll over. Again, I can't say how much a fat bike saves you in these situations. I am not a very good mtn biker. Basically, I have zero skills. But the bike did the work. It zoomed right up and over and I was airborne! Four inch tires at 8 psi make for pretty good suspension! I landed without incident much to my relief! Everyone had a blast. And I hope that Fat Bike categories take off at cyclocross races. It really is a great way to have fun at a cross race. The only thing that maybe isn't fun is trying to get a 28 pound bike over a high barrier! Eco-Cross is a great little race. The farm itself is reason enough to head down and check it out. 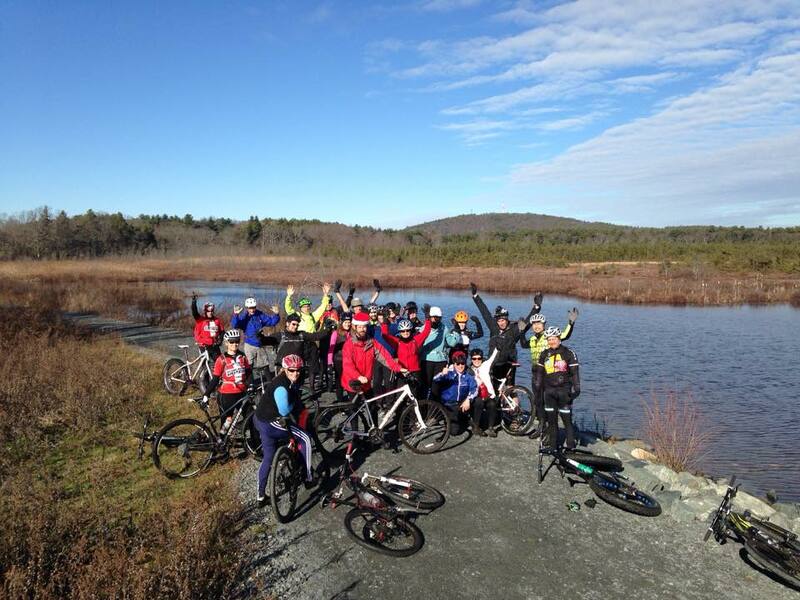 Huge thanks to both Corner Cycle and Coonamessett Farm for letting us spend the day shredding on Fat Bikes! Thank you to Lee Toma for always being so great and taking such terrific photos.